Our Sterling Silver Dog Tag Pendant is custom engraved with your loved one's actual handprint and footprint images for a truly one of a kind personalized keepsake. Makes a perfect gift for Father's Day, Christmas, or Dad's Birthday. 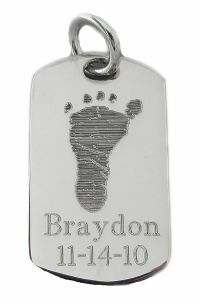 The dog tag pendant can be engraved with your child's actual: 1 Handprint, 2 Handprints, 1 Footprint, 2 Footprints, or 1 Handprint with 1 Footprint. Select which custom image you'd like on this pendant in the drop down box below. Your custom image is deeply engraved into a sterling silver dog tag, measuring 1.25" long x .75" wide x 1mm thick. An additional set of prints can be engraved on the back for an additional charge, select the option below. This is an ideal way to incorporate handprints on one side and footprints on the other side. Also great as a memento of twins.